We’ve started something new this year with our clients that we manage networks for. More and more as of late things are moving from the standard hardware defined networking model to a software defined model, which means greater unified visibility into your local network. That’s why we’re offering network standardization with Ubiquiti’s UniFi platform! Software Defined Networking (SDN for short), places the control of network configuration in the hands of an external or internal host, rather than having the config live on each individual device. So how does having control from one place benefit you as a business owner? Since ServantDesign is primarily a UniFi centric business, we’ll focus on how that product can streamline the day to day functioning of your network. Having a controller in the cloud (like with ServantDesign’s cloud hosted UniFi Controller) allows for extremely easy deployment of hardware. Sometimes, if the particular hardware that’s being added doesn’t have to have any kind of special mounting or grounding, we don’t even have to come on site. We can ship the part directly to you, and if you’re at least somewhat technically inclined, you plug the power in and connect an Ethernet cable, and we do the rest from the cloud! In every case where we have a UniFi Security Gateway (router/ACL firewall) installed, any new UniFi equipment plugged into the network is instantly recognized by the controller and available for adoption. When the Controller adopts the device, it automatically receives the correct configuration for the device type and is ready within minutes. For instance, say you add office space to your existing office, but it doesn’t have wireless coverage…we ship in 3 new access points, and within moments after they power on, they’re ready to go. For large scale deployments, we can ship the devices to us, configure them to the cloud controller before we even come on site and when they’re plugged in they’re instantly ready to be used. The main point to take away here is that there is little to no downtime in system upgrades. There’s no shutting down the network to integrate new equipment, etc, it’s all configured from the cloud within the existing network. Every customer we have that has moved to UniFi is amazed at how simple and powerful it can be. Brands like Cisco, Brocade, HP, and Ruckus make fantastic equipment for large corporate environments. They offer extreme longevity, and in a scenario where Cisco is your main hardware, iOS offers an incredible amount of security and functionality. I can’t think a single datacenter I’ve visited where Cisco isn’t the top dog running the show, and rightly so. But the fact of the matter is that most small businesses, and even some medium sized businesses don’t need the extra cost of Cisco enterprise equipment, and can achieve some of the same performance with Ubiquiti products. I want to be clear, advanced enterprise solutions like Cisco and Ruckus offer an entirely different level of networking that Ubiquiti/UniFi hardware is not meant to offer. That said, you can have nearly the same feature sets for a fraction of the cost. One Cisco enterprise AP can cost anywhere from $600-$1200, compare that to Ubiquiti’s most expensive UniFi AP at the moment which is the UniFi AP AC HD (high density) at around ~$340, or their UniFi AP AC Pro at ~$130 which has a 600ft range, broadcasts dual-band 2.4ghz and 5ghz AC wireless, and paired with a USG and Controller has guest control (paid or free), VLAN tagging for guest networks, and band steering to 5G, not to mention throughput speeds up to 1300mbps. You can’t beat the price for performance. All UniFi Switches come with 802.11af PoE, which can push 24v passive or 48v PoE+ to compliant AP’s making wiring easier and the need of PoE injectors obsolete. Compare the price of a Cisco 3650 48 port 750w at roughly $7000 to UniFi’s 48 port PoE 750w at $1025. Again, Cisco is advanced enterprise hardware, which most people don’t need, so Ubiquiti makes sense for smaller businesses that want enterprise grade equipment. As I’ve talked with my customers over the years, one of the things that I keep hearing is how little access their contract IT vendors give them to their own networks! To me, that doesn’t make sense. The customer owns the network, they own the equipment, and it’s their facility, they should at least have an idea as to what’s going on if they so desire. That’s where the cloud UniFi Controller comes in. 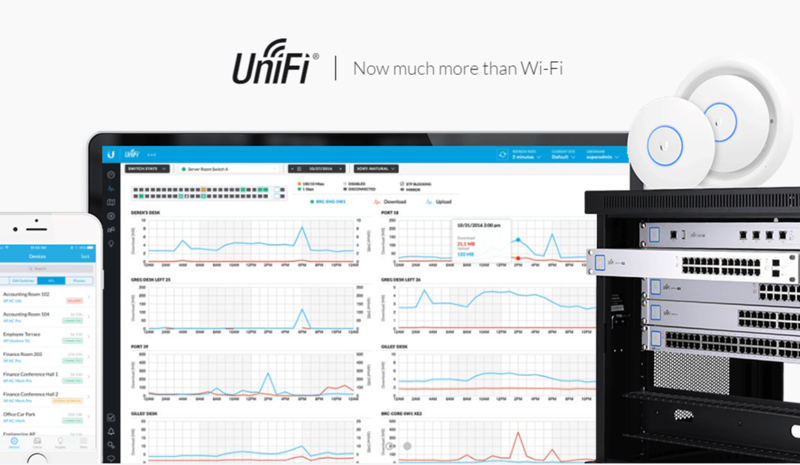 In a full UniFi network, the customer can see everything that’s going on in their network, from connected clients, total traffic, to speed and throughput tests, to information broken down into individual protocol using deep packet inspection, it’s all available right in the UniFi Controller. Depending on what privileges the customer wants, they can even revoke access to certain guests or users that might be abusing the network and internet they pay good money for. Visibility is key in staying aware of the security and health of your network as well. The UniFi Controller monitors “heartbeats” of all UniFi devices on the network, and will send alerts when hardware has lost power, been unplugged, and even when rogue access points have been detected. Aside from security, UniFi Controller can offer valuable insights into how your network is being used and what changes would benefit the speed and efficiency of the network. For instance, since expanding Wi-Fi at a local church and adding user’s phones to the network, on any given Sunday morning there are more than 60 devices connected to one access point in the sanctuary, which also happens to be connected to the same switch the church live streams from. This could cause an extreme bottleneck, putting undue strain on the one access point and create lag for those connected to the Wi-Fi that may want to use mobile devices during the service. Without the UniFi Controller, there’s no way we’d have been able to see what was happening, and now we plan to implement a Mesh style network in the sanctuary to balance the amount of users connected to any one access point. This is probably my favorite part about Ubiquiti’s UniFi products. Because the devices are built to be controlled remotely and with upgrades in mind, they keep getting new features that weren’t available when they came out! Case in point…the UniFi Security Gateway Pro 4 (the rack mount version of the original USG) currently only has two LAN ports (RJ45), two WAN ports (RJ45) and two more SFP WAN ports. Wouldn’t it be nice to be able to use those two SFP ports for fiber or stack copper to downstream switches? At the moment you can’t do that, only RJ45 on the two LAN ports can do that, BUT…on the roadmap for this year, Ubiquiti’s UniFi team plans to upgrade the UniFi Controller and UniFi device firmware so that any of those ports can be reassigned to LAN or WAN. It’s amazing to me that hardware that’s 3 or 4 years old is still getting updated with new features and current firmware! Some of the original UniFi AP’s are still kicking along just fine. All that to say, we love UniFi, and we’d love to show you how useful it can be to your small business. Contact us today for a free site assessment and quote for your UniFi conversion!